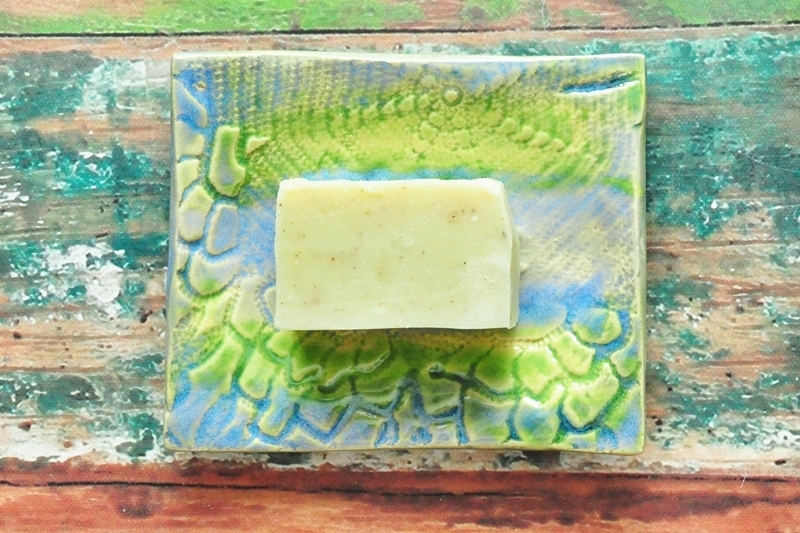 It’s hard for me to keep listing new soap and anything dishes as they sell so quickly. What you see may or may not be available. If you like any of them, just ask if I still have it, or I might be able to create a similar dish for you if you don’t mind waiting for it. My production time varies. A fun piece. I think I’ll make more along this theme. 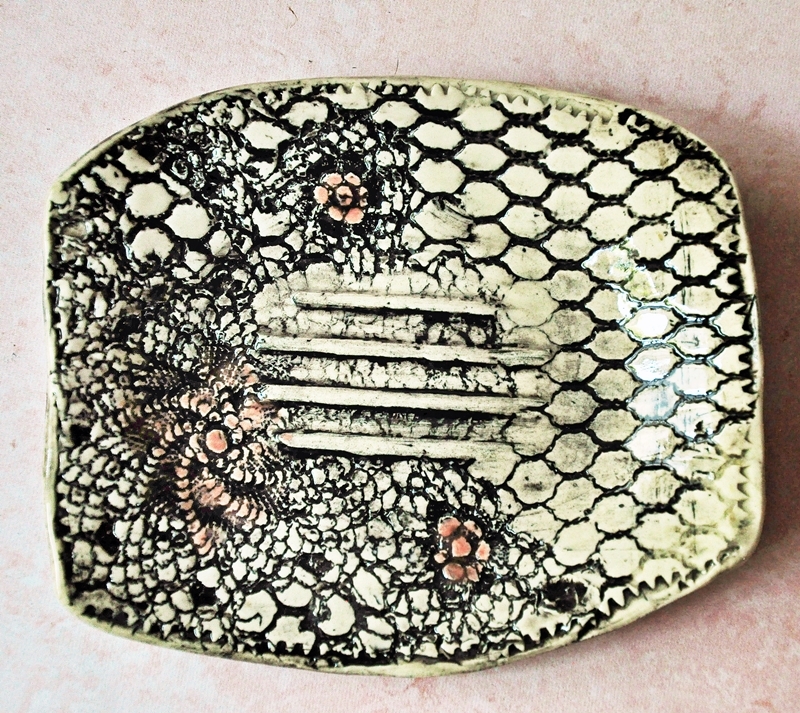 Lovely soap dishes in stoneware with black stain and non toxic gloss glaze. 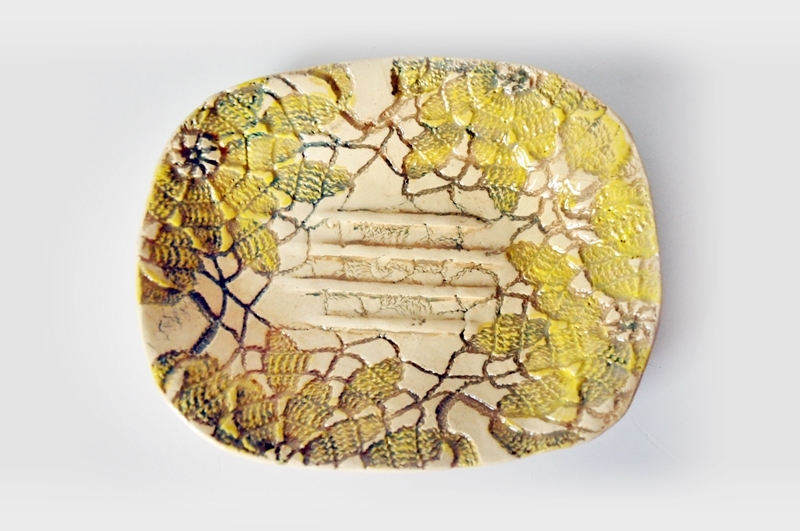 Measures approximately 4″ (10.2 cm) x 5.25″ (13.3 cm). Available in black and off white or other colors by special order. Elegant and practical. Holds a large bar of soap, or use it as an attractive spoon rest. 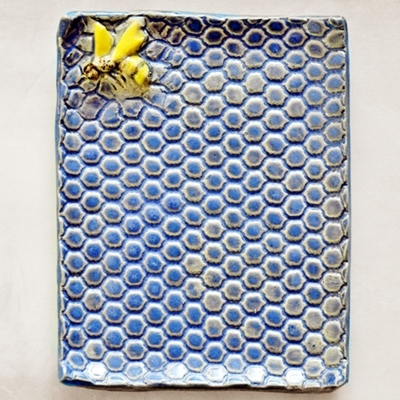 Small handmade (slab built) stoneware tray or plate with honeycomb texture, glazed in ultramarine blue. A little bee graces the top left corner. Multi-functional, it would be at home in a living room as easily as in a kitchen or bathroom. 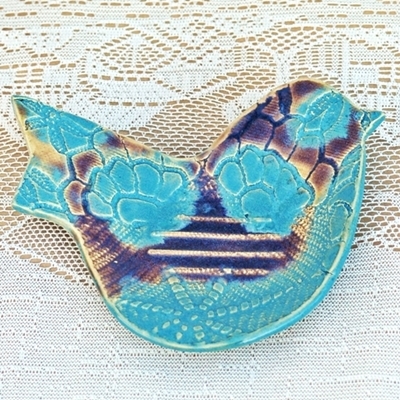 Use for soaps, jewelry, votive candles, etc., or as a spoon rest. 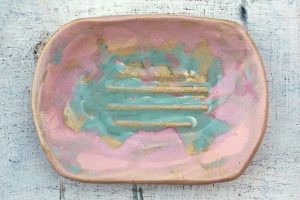 Made with food safe glazes so can be used as a small serving plate as well. Measures 4″ (10.16 cm) x 5.5″ (14 cm) x .25″ (.6 cm). St. Brigid, who lived in 6th century Ireland, was known for her healing and weaving abilities. It is she who came up with this particular weave design, often seen made with blades of grass. 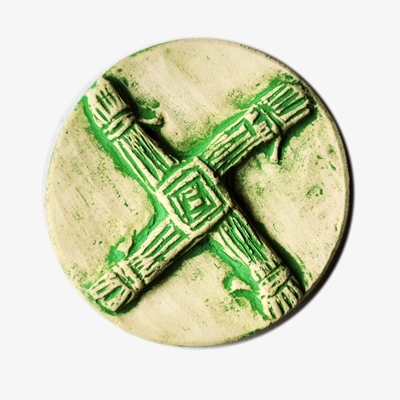 The tradition of making St. Brigid’s Crosses on the 1st of February, St. Brigid’s Feast Day, is still alive. 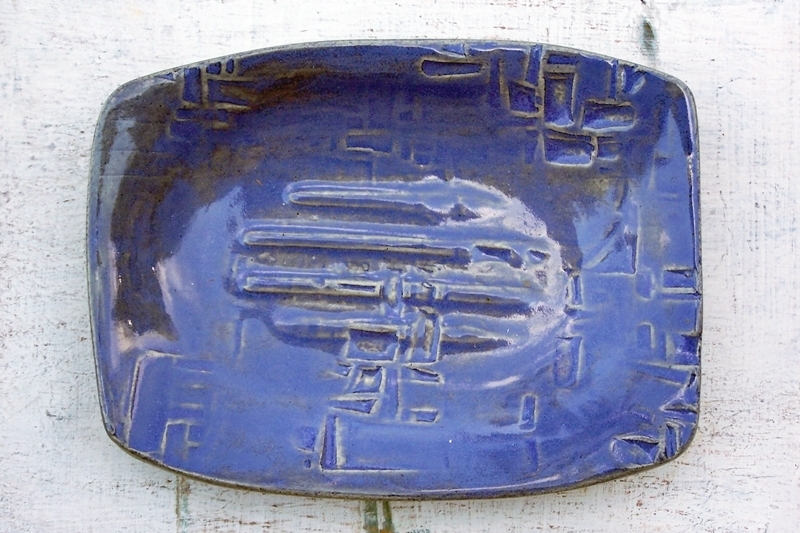 This anything dish features a sitting Buddha in its centre. 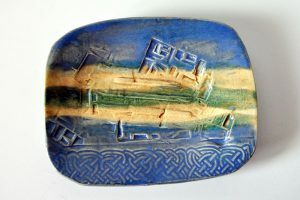 It was hand glazed with a fine paint brush. Glazes are all food safe.This little dish is made of durable stoneware and fired to mid range. 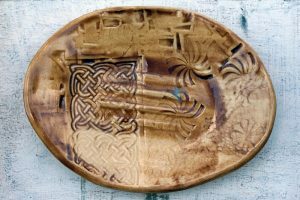 It can have many uses: as a cone incense tray, soap dish, tea bag holder, spoon rest, candle dish, catch all, or use as a small serving tray. 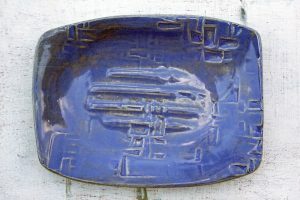 People have also purchased “anything dishes” similar to this one to embed into their mosaics as a focal piece. 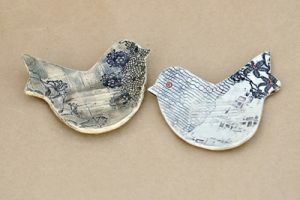 Others have glued a hanger on the back so they could decorate their wall. The uses are limited only by one’s imagination! Measures approximately 3″ (7.6 cm) x 2.5″ (6.35 cm). Colors may vary. Cat face shallow bowl/small plate. Hand made in white stoneware. Glazed on both sides with food safe glazes. Multi-functional. 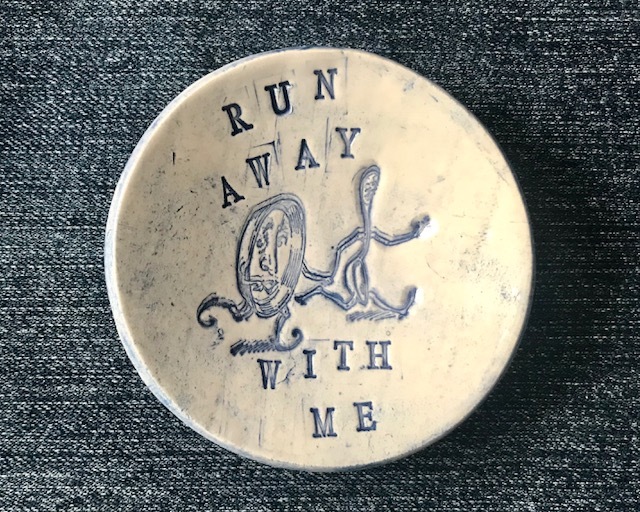 Measures approximately 4.75″ in diameter x 3/4″ high. 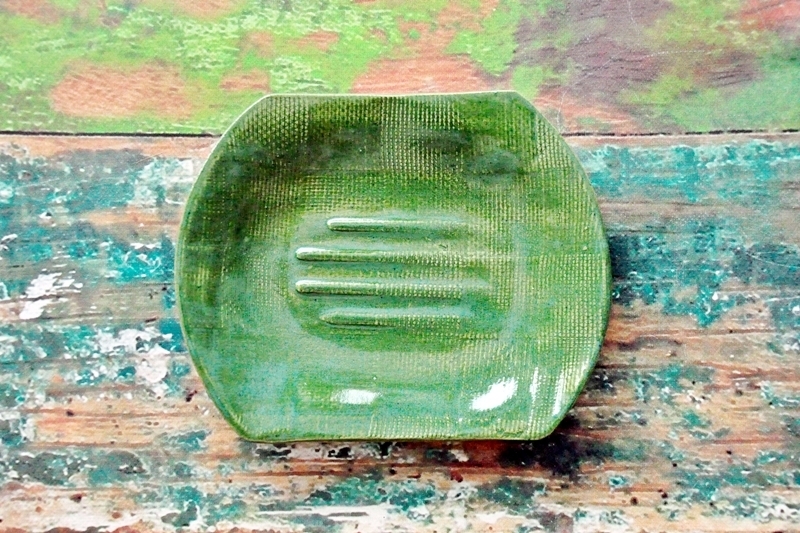 A one of a kind soap dish crafted from white stoneware and glazed in dark leaf green. The texture has been created with plaid weave fabric. Kiln fired with non-toxic glazes to mid-range. Measures approximately 4″ (9.8cm) x 5″ (13 cm) x 3/4″ (1.5 cm). 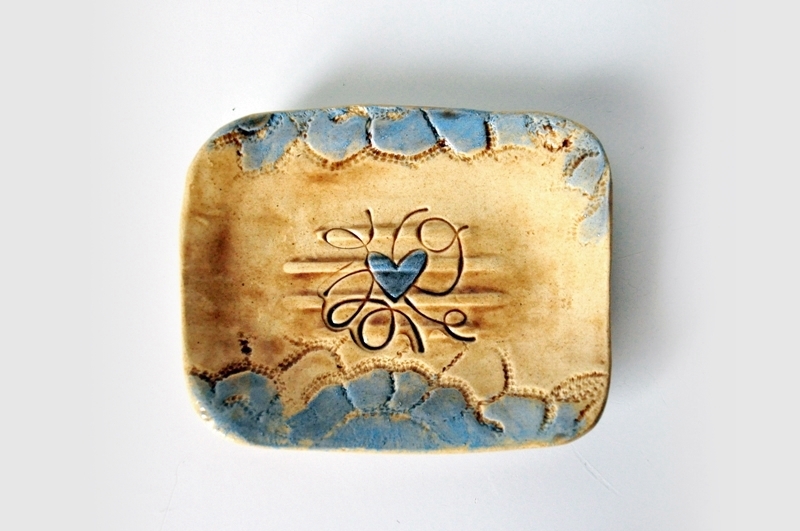 A beautiful one of a kind soap dish crafted from white stoneware and glazed. 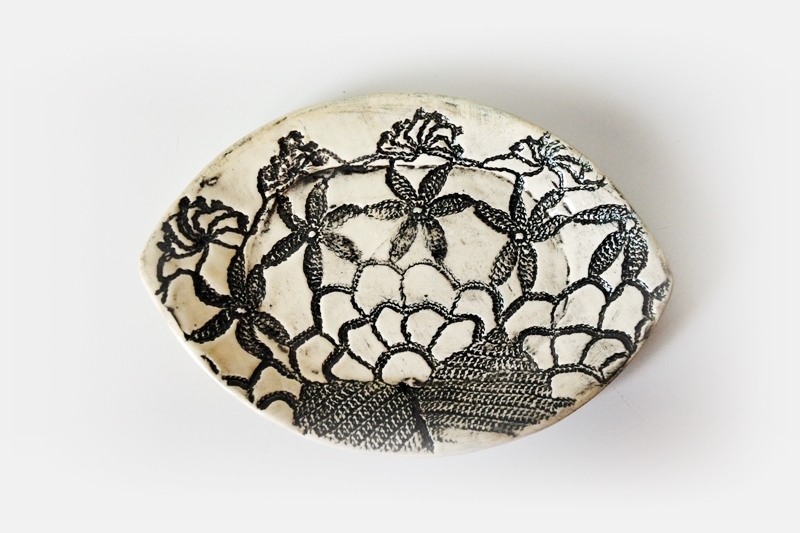 The texture has been created with a vintage crocheted doily. Rustic, yet elegant. 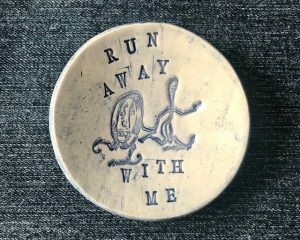 Perfect for your bar of soap, or as a catch all. Can be ordered in black and white. 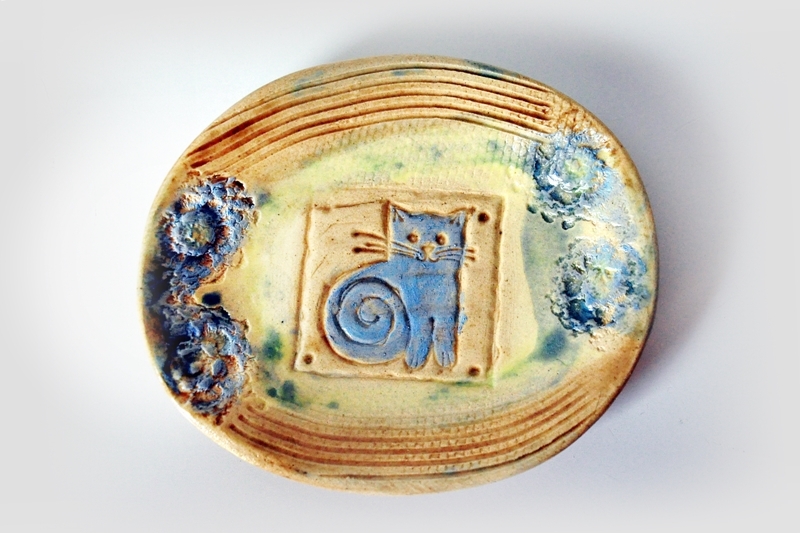 Stoneware soap dish shaped like a fish with ocean inspired impressions. This dish is truly one of a kind. Glazed in clear non-toxic glaze over oxide and kiln fired to mid range. 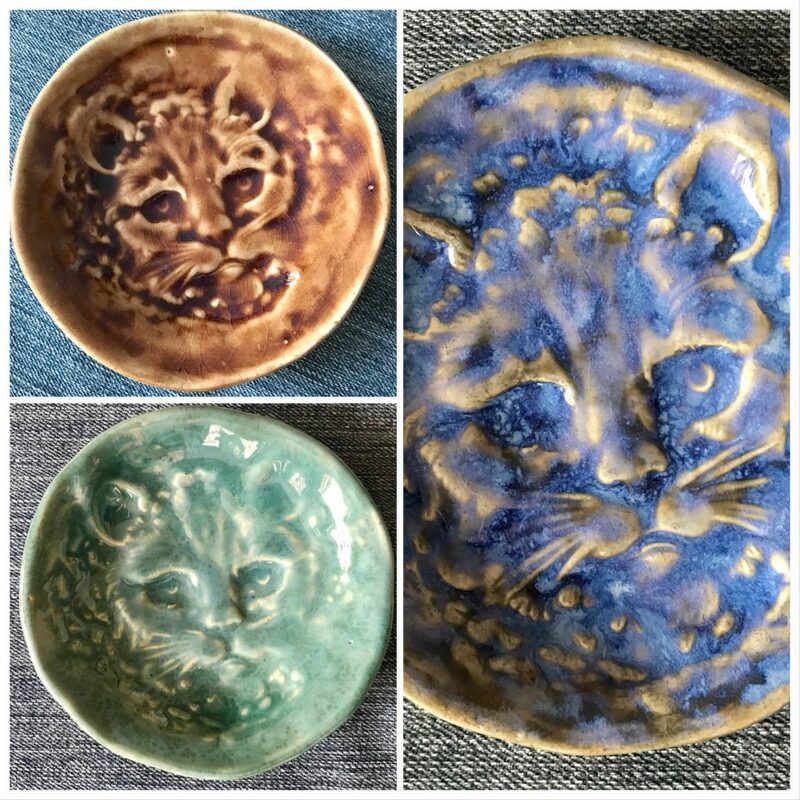 Use as a soap dish, spoon rest, catch all dish, etc. 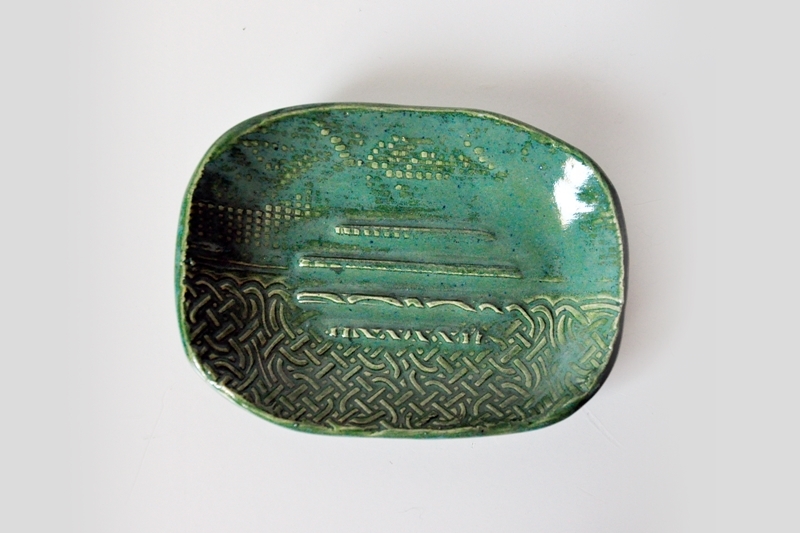 Measures approximately 4″w (10 cm) x 6″ l (15.24 cm) x .25″ h (.65 cm). 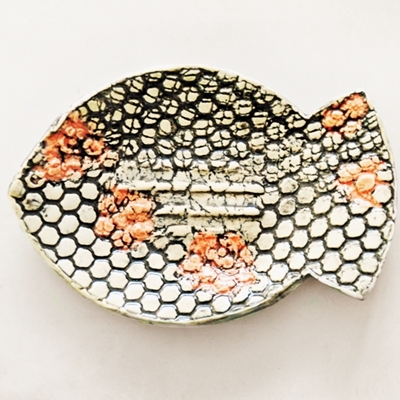 Stoneware soap dish shaped like a fish with lace flowers glazed in red and mesh impressions. 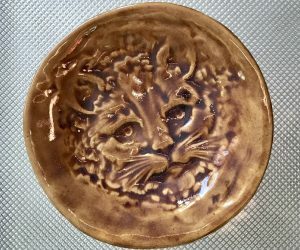 Glazed in clear non-toxic glazes over a black stain. Kiln fired to mid range. 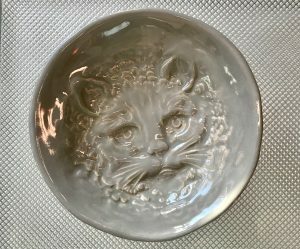 Use as a soap dish, spoon rest, catch all dish, etc. 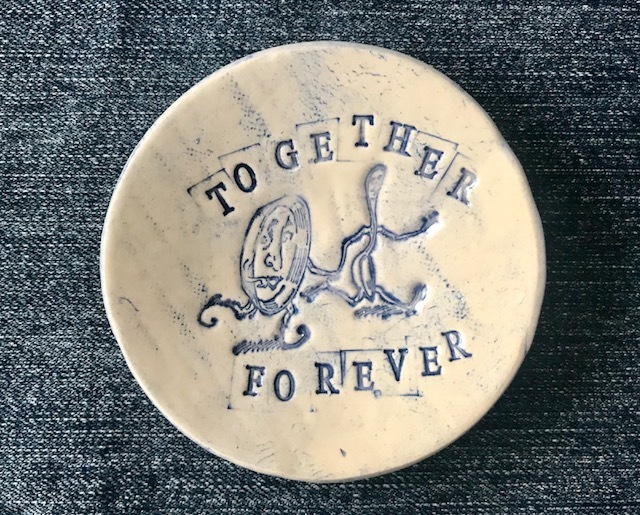 One of a kind soap dish crafted from white stoneware and glazed in light brown with a touch of grey. 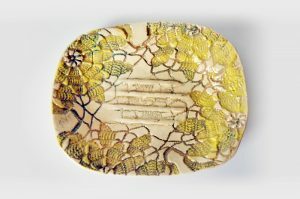 The texture has been created with a carved batik block. 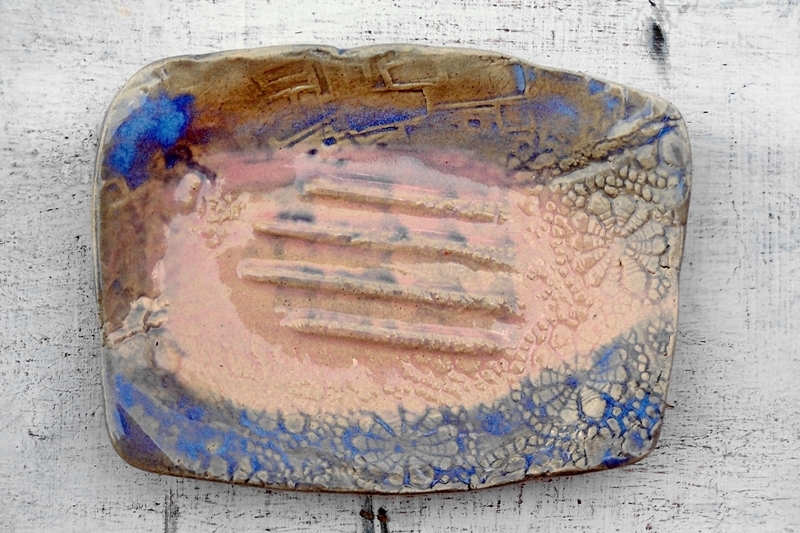 Kiln fired with non-toxic glazes to mid-range. Measures 4.5″ (11.4 cm) x 5″ (13 cm) x 3/4″ (1.5 cm). 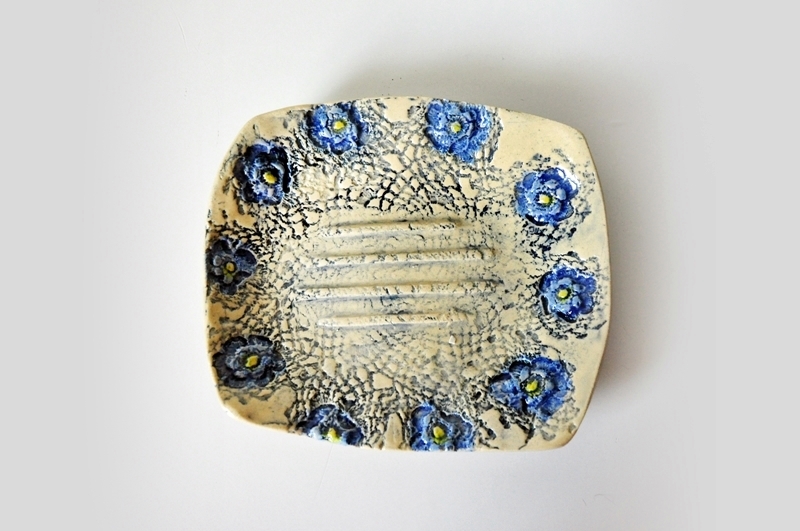 A beautiful one of a kind soap dish crafted from white stoneware and glazed in castile blue glaze with red flowers, the texture having been created from a carved wood block. 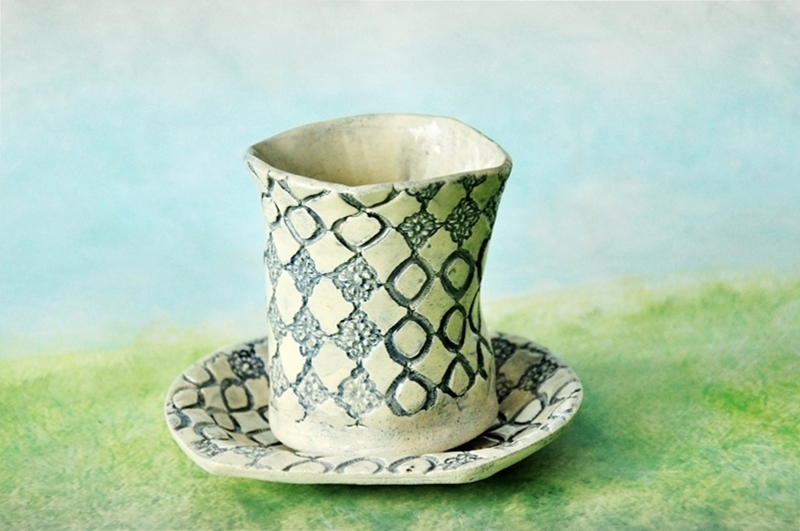 The style would suit many decors, including shabby chic, Boho and eclectic. 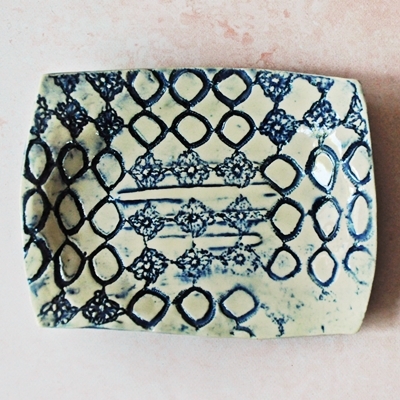 Kiln fired with non-toxic glazes to mid-range. Measures 4″ (10 cm) x 5″ (12.7 cm) x .75″ (1.9 cm). 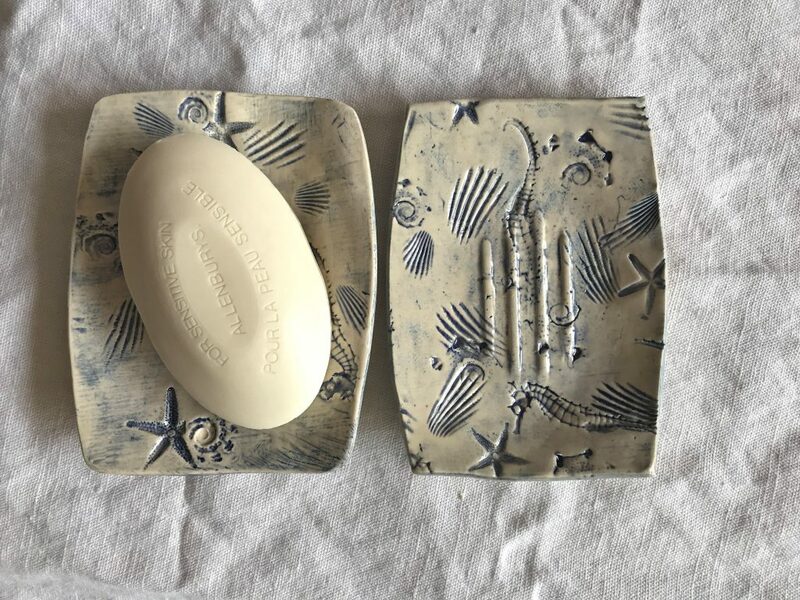 Stoneware soap dish with ocean themed impressions. Glazed in clear non-toxic glazes over blue oxide. Kiln fired to mid range. 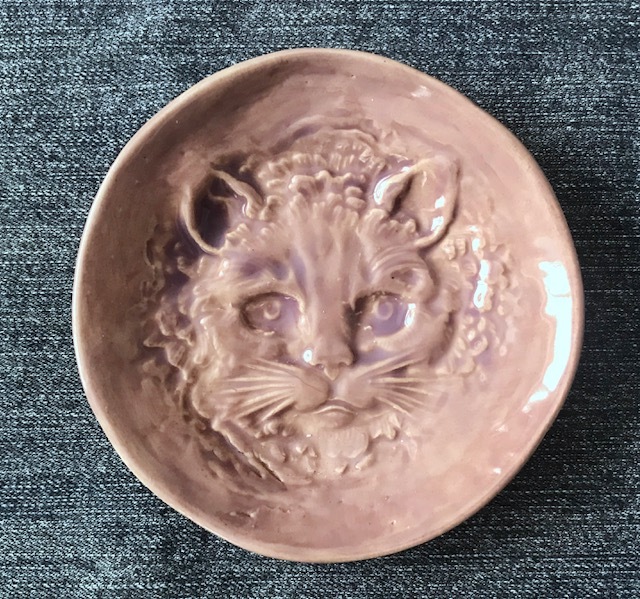 Use as a soap dish, spoon rest, catch all dish, etc. Measures approximately 4.5″ w (11.43 cm) x 5″ l (12.7 cm) x .25″ h (.65 cm). 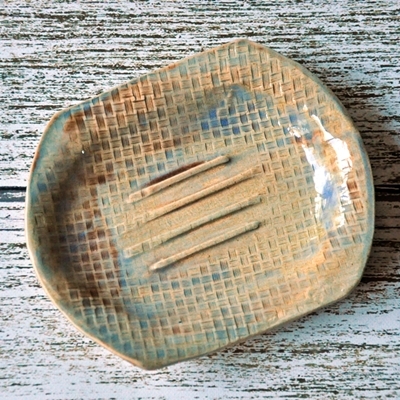 A beautiful one of a kind small anything dish crafted from white stoneware and glazed dark brown over tan and blue. The texture has been created with a hand crocheted doily. Food and microwave safe. 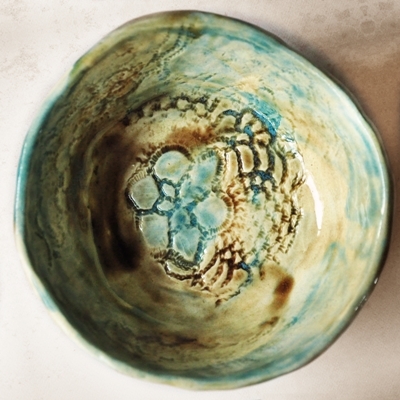 Hand washing is recommended though to keep the glaze bright. 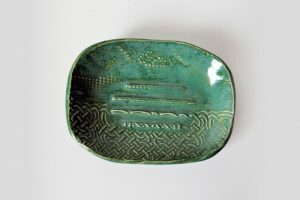 Measures 4.5″ (11.4 cm) wide x 5.5″ (14 cm) long x .75″ (1.9 cm) high. 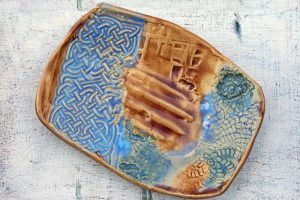 A beautiful one of a kind textured soap dish crafted from white stoneware and glazed in light beige, tan and periwinkle blue food safe glazes. A nice choice for a neutral décor. 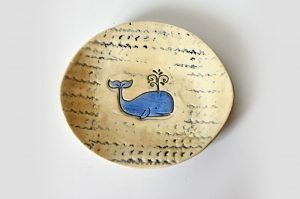 Measures 5″ (12.7 cm) x 4″ (10 cm) x .75″ (1.9 cm). 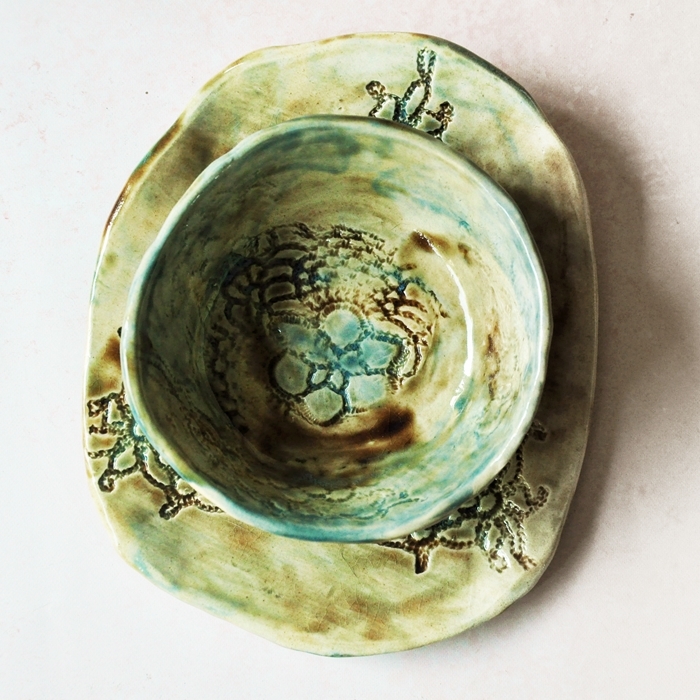 A perfect little dish that will suit pretty much any decor, from formal to modern to casual eclectic. Use for soap, jewelry, candles, on a desk, or can have many other uses. This version is slightly wider than my similar listing. 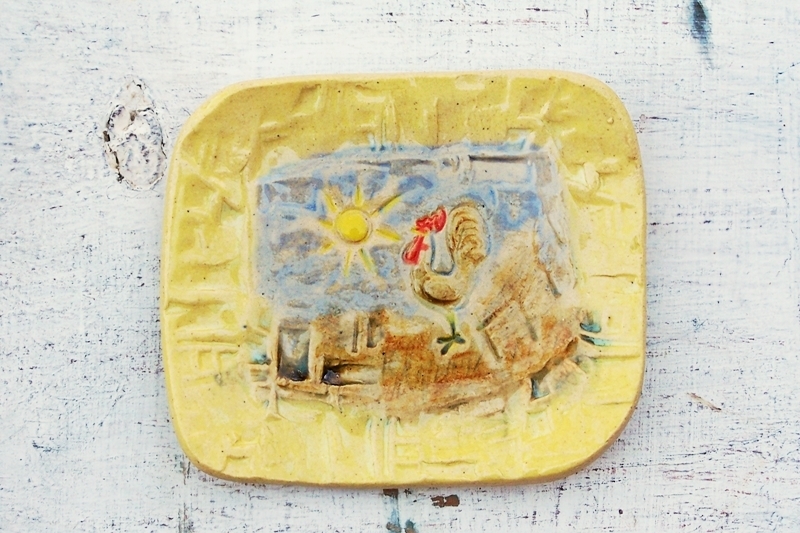 Made of white stoneware clay, colored with an oxide then glazed and fired to cone 6 (mid-range). Measures 4.25″ (10.8 cm) wide x 5″ (12.7 cm) long x .75″ (1.9 cm) high. Meant to Be, etc. (Ask about alternative colours). Another one of a kind soap dish crafted from white stoneware and glazed off white and teal blue. The texture has been created with vintage lace. 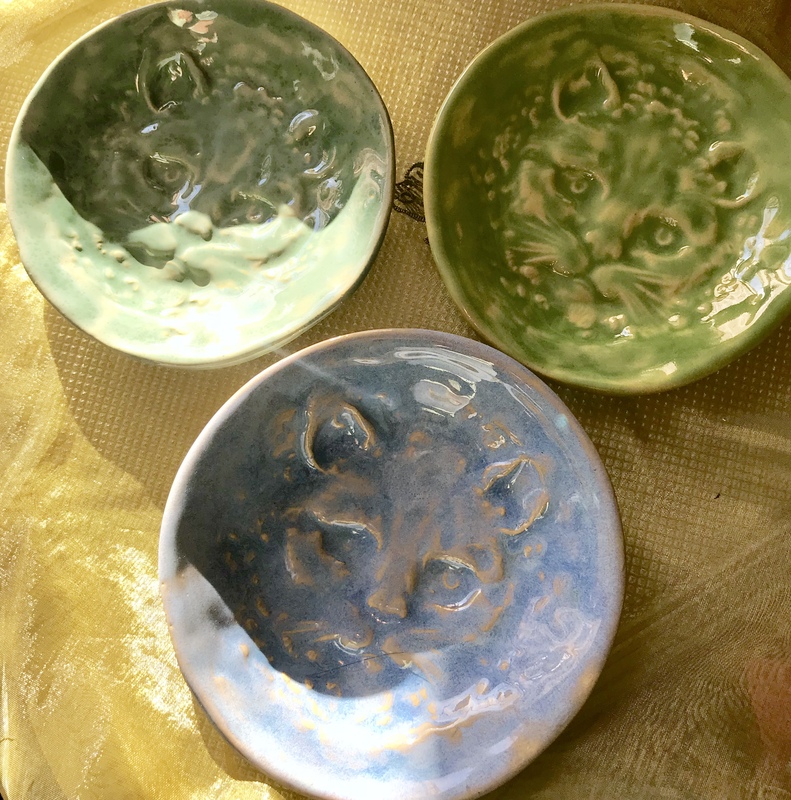 Kiln fired with non-toxic glazes to mid-range. Measures 3.75″ (9.5 cm) x 5″ (13 cm) x 3/4″ (1.5 cm). 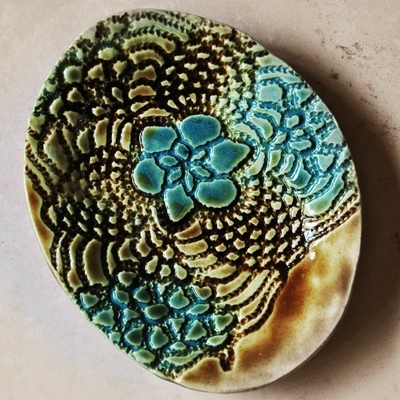 Triangular shaped plate, glazed in water blue and brown, with beautiful lace texture. 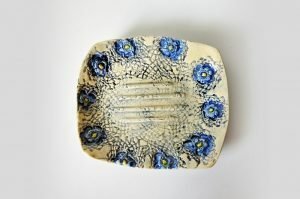 Hand made in white stoneware. Multi-functional. 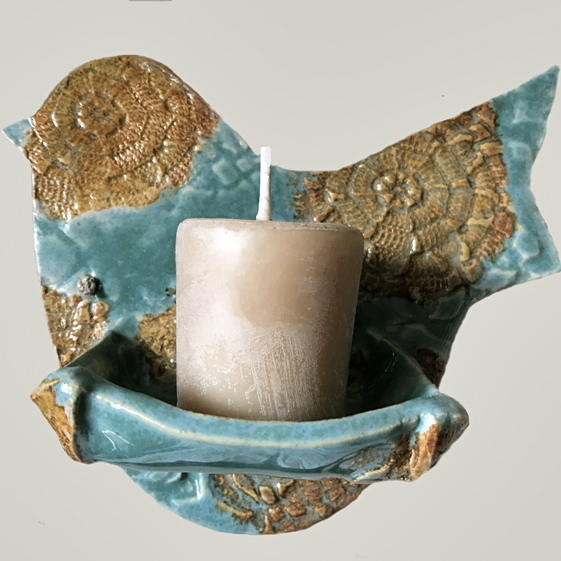 Use for soaps, jewelry, votive candle, trinkets, spoon rest, tea bag holder, etc. Food safe glaze. A nice accent for a side table. 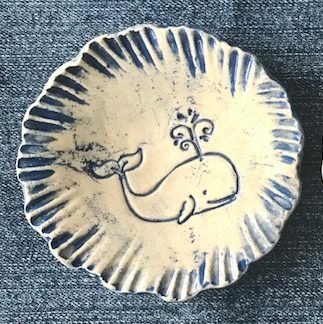 A pretty hostess or teacher’s gift, or a little something special for your friend. Measures 6.5″ (16.5 cm) and 4″ (10.16 cm) across. 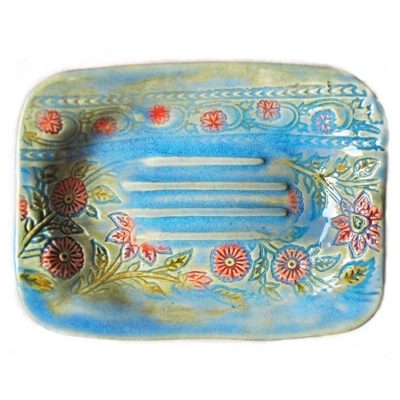 A beautiful one of a kind soap dish crafted from white stoneware and glazed in light blue and green. 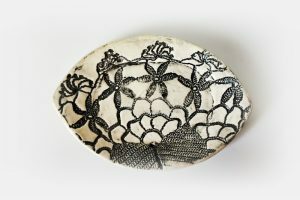 The texture has been created with a lovely piece of vintage lace. 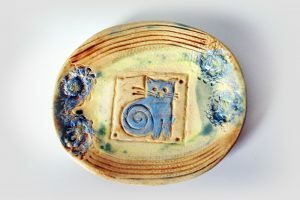 Kiln fired with non-toxic glazes to mid-range. Measures 4″ (9.8cm) x 5″ (13 cm) x 3/4″ (1.5 cm). 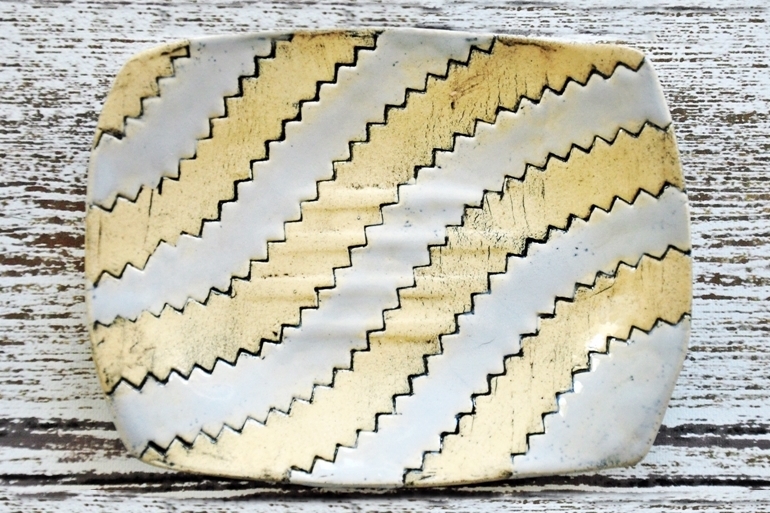 Black zigzag stitching pattern runs across the surface of this stoneware soap dish. Glazed grey alternating stripes. Custom colors available.